If you seek elegant black photo frames with some sparkle, these beveled glass beauties will be a great way to show off the photo inside. They are also perfect as table numbers and for centerpieces for weddings, proms or other black tie affairs. 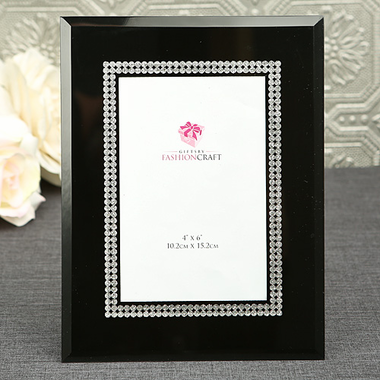 Each frame measures 8.5"H x 6.5" and has a sparkling silver inlaid inner border draws the attention to the photo window. The frame itself is smooth, with the silver beaded pattern below the surface. You can display a vertical or horizontal 4" x 6" photo or insert, which is the most popular photo size. Each has a black velvet easel back and is individually packaged in a white box.